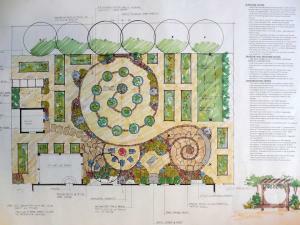 Intricate stone work unites this beautiful garden. Low, stacked stone walls allow the home to transition smoothly to the large, flat site, while creating needed structure and height. Loose plantings of ornamental grasses, Russian Sage and low growing junipers allow the walls to play center stage. Multiple levels of patios, a gravel fire pit area, and gorgeous circular stone herb garden are carved into the outdoor living spaces. A relatively small lawn transitions to meadow grasses, farm land, and views of the Wasatch Mountains beyond. 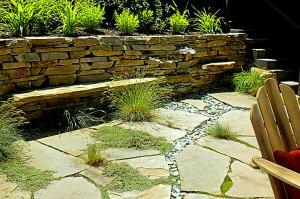 The garden exude a real sense of serenity and integration to the surrounding natural landscape. Sometimes challenges can make the best designs. A steeply sloping lot afforded both brilliant views and secluded wooded areas. Detailed stone steps lead to the front door, and then again to the lower area of the back garden. Here a beautiful stone fire pit is nestled among maple and chokecherry trees, offering seclusion and a sense of being one with nature. 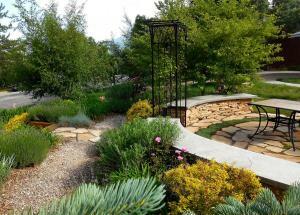 Native and drought tolerant plantings blend with the high desert mountain native plant palette. This garden is especially beautiful in Autumn. A thirsty, sloping lawn is replaced with raised timber beds filled with year round, gorgeous color and texture, and an Idaho Fescue 'lawn'. The lawn can be mowed for a manicured effect, or left un-mown will have a delightful meadow look, growing to about 6" tall. In the timber walls, the Moonlight Garden features drought tolerant grasses, perennials and shrubs in shades of white, cream, blue, silver and purple. The Sunlight Garden boasts the same in hues of red, orange, silver, yellow and gold. 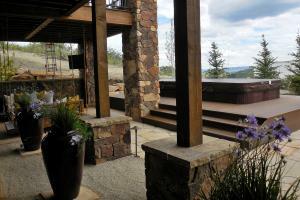 The natural stone path steps up through the color gardens, past the custom iron trellis, and terminates in a front garden stone patio and seatwall that affords excellent views of the surrounding mountains. This garden is wonderful and interesting in all seasons. Drifts of color, use of native boulders, a unique water feature and a traditionally designed herb/vegetable garden help an elegant estate blend into it's rural setting. The area immediately surrounding the home was thoughtfully landscaped with drought tolerant plantings, while a shade pavilion and several stone patios allow for family entertaining. The naturally designed stream and water feature, created with stone uncovered on the site during home construction, originates in a concrete livestock trough that was acid stained and distressed to give it an antique look. The water flows into the stream and pond, which has been set up with a beach entry to accommodate adventurous grandchildren. The landscape transitions to narrow lawn areas, which then transition to pasture grass, adjacent farmland and stunning views of the local mountains. This has turned into a wonderful retreat, as well as a gathering place for friends and family.